The Victorian Amateur is down to the final eight, which sees Nathan Holman up against Rory Burke in one of the standout matches for tomorrow’s quarter-finals. Earlier Holman accounted for Geoff Drakeford, 1-up, in their second round match after disposing of Tim Coffey on the 19th in the opening round. Burke defeated James Zappelli, 3&2, in their second round encounter after eliminating Jake Laubsch, 6&4, in the first round. The Bourke/Holman match-up is set to be a classic between two of Australia’s emerging amateurs who have represented their country on numerous times, yet have never met each other in match-play. Bourke has recently secured three top-five finishes at the Port Phillip Amateur, Dunes Medal and the Portsea Open Amateur and continued his form with solid play today. “You need to be aggressive in these matches as pars won’t win holes,” says Bourke. Bourke is yet to win a National Selection event, however the Victorian’s consistency in the bigger amateur events is one of his stand out qualities. With a runner-up finish at the 2010 Tasmanian Open and a third place finish at the South Australian Amateur Classic, it’s only a matter of time before a title falls into Burke’s hands. “Nathan has probably won more events than me,” says Bourke. 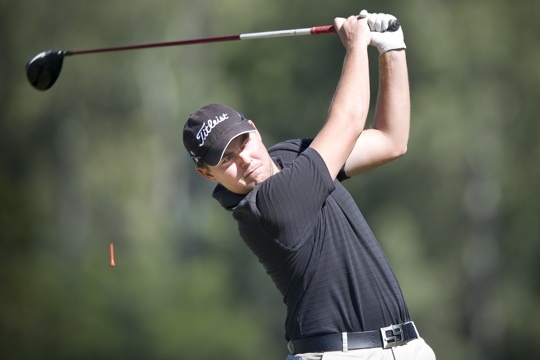 Holman is a previous National Selection event winner, winning the prestigious Riversdale Cup in a play-off over Matt Stieger last March and recently Holman won the Portsea Open Amateur. Holman rates today’s second round 1-up victory over Geoff Drakeford – where he birdied the last three holes for wins – as one of his best match-play victories which will hopefully flow in to his game for the remaining matches in this championship. “It was a corker of a match to get that win up,” said Holman. Brady Watt, winner of the 2011 Lake Macquarie Amateur, is another standout at these championships. Watt demolished Daniel Nisbet, 2-up, in today’s second round after earlier accounting for Daniel Bringolf, 1-up, in the morning. These two important wins will certainly give Watt the added confidence to continue at this championship. Watt will play Tim Baker after Baker accounted for Jordan Zunic, 1-up, and earlier defeating Anthony Houston, 3&2. Zunic had eliminated one of the championship favourites, Todd Sinnott, in the opening round with 2&1 victory over the 2011 Dunes Medal winner. In the upper half of draw the number one seed, Cruze Strange, will meet James Gibellini after Gibellini defeated Tasmania’s Ryan McCarthy, 1-up, in their second round match after winning against Michael Williams, 6&5, in the opening round. Ben Eccles will play Troy Moses in the other top-half quarter-final after Eccles defeated Rick Coleman, 1-up, in the second round and Moses accounted for Kevin Marques on the 21st.